I don't know about you, but I had been looking forward to yesterday since the first of the year, and it truly did not disappoint. No, I don't mean the Republican presidential primary. I'm talking 100 years of Oreo cookies. That's right, that famous sandwich of two chocolate wafers with creme in the center was born on March 6, 1912, at a Nabisco factory in the Chelsea neighborhood of New York City. And life has been that much sweeter ever since. 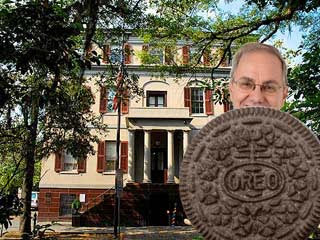 Hey did you know that the first Oreo ever sold was in a grocery store in Hoboken, NJ? Yep, the city directly across the Hudson River from the Nabisco factory knew a good thing when they saw it, and made that famous sale. Hoboken was also the site of the first baseball game ever played (the whole Abner Doubleday in Cooperstown story is a myth), was the backdrop for the famous Brando movie "On The Waterfront", and the birthplace of Frank Sinatra, Eli Manning, and indie filmmaker John Sayles. Of course it was also the birthplace of Jon Corzine and Pia Zadora, so I guess it has had it's share of duds as well. I heard one time that Pia Zadora was in a production of The Anne Frank Story that was so bad, that during the final scene - when the Nazis burst into the house - the audience screamed out "She's in the attic!" Gosh I love that joke. What was I talking about? Oh yeah, Oreo cookies... how could I forget? Do you know what the word Oreo means, other than delicious goodness? Neither does anyone else. Seriously. There are lots of theories and speculation, but even the folks at Nabisco are not really sure. Best anyone can figure is that it just sounded good. Of course it has gone through some rebranding over the years. To date, it has been known as the Oreo Biscuit (the original name), the Oreo Sandwich, the Oreo Creme Sandwich, and the Oreo Chocolate Sandwich Cookie. Its ingredients have changed as well. The original recipe had lard in the filling, which was then switched to partially hydrogenated oils (trans fats), and finally just non-hydrogenated vegetable oil. Boy, I wish I was alive 100 years ago (I wasn't) to have one of those lard Oreos. The design on top of the cookie itself has been tweaked and refined over the years, as well, but by and large it's the same cookie that debuted 100 years ago. Over the years, additional products have been added to the Oreo line. Fore example, the Double Stuff Oreo - introduced in 1975 - has twice as much filling as a regular Oreo. Too sweet for my tastes. I think the ratio of filling to cookie is just right in the original. It would be like doubling up on the McCartney and not the Lennon, if you know what I mean. The Triple Double, introduced in 2011, is a whole other kettle of fish. That's three wafers with both chocolate and original creme between. Those babies are 100 calories each folks. Keep that in mind the next time you knock back a sleeve of them while watching Jersey Shore. You can't have a 100th anniversary without a commemorative edition, and Nabisco recently began sales of the limited edition, sprinkle-filled birthday Oreo. A bit of a disappointment if you ask me, but heck, it's still an Oreo, and they go down. Of course nothing lasts forever. The Hydrox reigned supreme as the creme-filled chocolate cookie of record prior to the Oreo. They finally went out of business in 1996. Should Americans ever lose their taste for the Oreo (not likely), sales of them have begun to take off in China. They tweaked the recipe to be not so sweet, and they've become the best-selling cookie in China. There are 1.4 billion people in China, in case you had forgotten. Well, I am heading back (with some Oreos) to my timeshare rental on beautiful Tybee Island, GA. There is another 100th birthday going on in Savannah, GA, just about 20 miles from here. On March 12, 1912, Juliette Gordon Low began the Girl Scouts of the United States America from her home, which is now the Juliette Gordon Low Birthplace and museum. I plan on touring it, and the site of the first-ever headquarters of the GSUSA. I'm told the scouts have also branched out into the cookie business. Sounds like some field research is in order. Man, I love my job.